Leaders Lab / The Organisation Itself / How do leaders create inspiring visions? How do leaders create inspiring visions? During the space race, a group of US senators visited NASA. One asked a man cleaning the floor: ‘So what do you do?’ The man replied: ‘I’m helping to put a man on the moon!’ The cleaner felt himself so involved in the organisation’s vision that he felt inspired and excited by it. And how often does that happen? Unfortunately, not often enough. To create that inspiring vision, leaders need to create a process that involves everyone, that allows people to contribute to a shared view of the future, which is powerful and engaging for all. It’s simple – but it isn’t easy. How do you fulfil your vision? Design a plan that focuses everyone’s efforts solely on its achievement. A strategic plan might sound good, but until it’s implemented and the results measured, it’s just a document. Now comes the tricky bit… Live, breathe and role-model the vision every day. 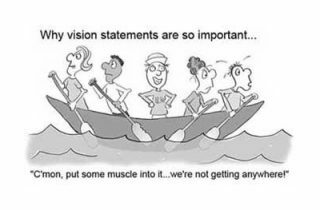 Successful leaders never assume that their organisation is ‘on board’ with the vision – they go on and on and on about it. This is the primary job of leadership – not the day-to-day detail. Concentrate on clearing obstacles to fulfilling the vision. Every person needs to understand why they’re doing what they’re doing, and why it’s important to the overall vision of the organisation. Don’t do people’s jobs for them, or chase them to do their jobs; clear the way for them to do their own jobs effectively. Then you’re really holding the vision, and doing your own version of putting a man on the moon.